The specific piece that caught my eye isn’t the one pictured above, though it is similar. Called Solstice d’Hiver, the painting shows a bundled-up young girl. She’s moving across a frozen, inhospitable landscape all alone. She doesn’t really look sad or worried or in pain. She just looks resigned to the haunting, overwhelming landscape that surrounds her. The painting is in the Gallery 1, if you’re ever there. I highly recommend a look. This entry was posted in Broad Strokes, The Great Outdoors and tagged Art, Emily Carr, Evening Visitor, Jean-Paul Lemieux, Kleinburg, McMichael Canadian Art Collection, National Gallery of Canada, Ontario, Ottawa, Quebec, The Group of Seven, Tom Thomson, Toronto, Travel by mmhague. Bookmark the permalink. His work is very surreal – glad you brought his work out to be discovered. 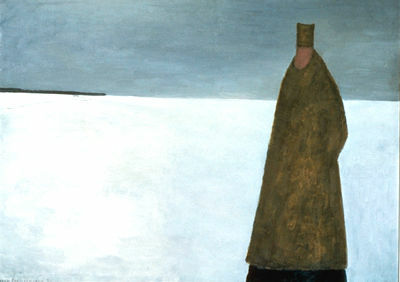 I love the Quebec artists – how their rural and catholic influences are just different enough from the mainly Anglo experience of Ontario to be compelling. I know of his work – but haven’t seen it in a long time. Nice review. Have you seen the work of Ben Shahn? – similarly gripping and stark images – almost illustrative. Thanks so much for your comment! I haven’t seen the work of Ben Shahn yet in person, but it looks interesting online.